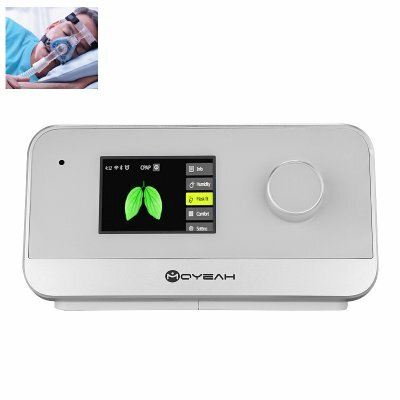 Successfully Added MOYEAH CPAP Ventilator - 3.5-Inch Display, EPR, IPR, Integrated Air Humidifier, SD Card Slot, Data Management (White) to your Shopping Cart. With this professional-grade CPAP ventilator from MOYEAH, everybody will get a good nights’ rest. This health gadget treats you to a continuous flow of positive airway pressure. By continuously providing you with a mild air pressure, it helps you to breath effortlessly throughout the night. This makes the CPAP ventilator extremely helpful for those of you that experience breathing problems or are suffering from sleeping apnea. Thanks to its high-end features, this health gadget can be used for both personal usage and professional usage alike. This smart CPAP ventilator from MOYEAH switches on automatically whenever it detects a person breathing. Before you fall asleep, your health gadget applies a low air pressure that helps you to fall asleep in a comfortable and natural manner. Once you have fallen asleep, the CPAP ventilator will increase its air pressure to make sure that you’ll always inhale the required amount of oxygen with every breath you take. Its intelligent pressure release algorithm and EPR technology make it possible for the machine to apply less pressure when the patient is exhaling and more when he is inhaling. Thanks to this, a natural breathing rhythm is simulated to increase the user’s comfort at night. The 3.5-Inch display of this CPAP ventilator adjusts its brightness automatically based on the natural light in your environment. Therefore it won’t blind the patient at night and keep him from sleeping. The machine comes with a 32GB SD card slot that allows you to store the data obtained during your previous sleeping sessions. It is possible to analyze your breathing patterns and compare data over a one year period of time. With its low-sound design and built-in air humidifier, this health gadget treats you to extra comfort at night. With this CPAP ventilator at your side, you’ll never experience a restless night again. The MOYEAH CPAC ventilator comes with a 12 months warranty, brought to you by the leader in electronic devices as well as wholesale electronic gadgets..